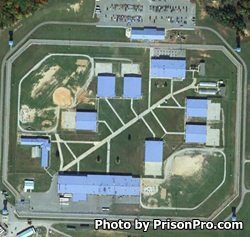 Lunenburg Correctional Center opened in 1995 and is a level 2 facility located in Victoria Virginia. The facility can house approximately 1,200 male inmates of varying custody levels. In addition to housing inmates, Lunenburg Correctional Center serves as a reception and classification center that processes inmates from local jails into the Virginia Department of Corrections. Offenders are housed in six buildings with approximately 150 offenders in each building. Inmates at Lunenburg Correctional Center are provided basic medical, dental and mental health services. This facility participates in the Virginia Correctional Enterprise program and employs inmates in an upholstery and seating operation. Offenders can also participate in a program that pairs inmates with dogs from a local shelter. The inmates are responsible for training the dog and preparing them for adoption. Visits at Lunenburg Correctional Center occur on Saturdays and Sundays and use a rotating schedule, because of this you will need to contact the facility for the current rotation.